Although the Library’s main focus is acquiring electronic resources, printed collection is still a big part of the collection. Currently, the Library holds more than 25,000 titles, mostly available at the TSDAS Digital Library in Kuala Lumpur. These materials are used by students throughout the region through the usual loan as well as Interlibrary Loan. Locating printed Books is as easy as ABC. 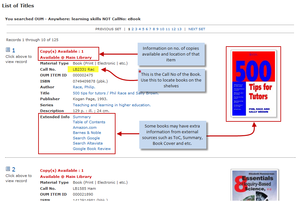 Please follow this guide to locate & retrieve printed books. 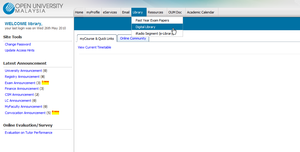 From myVLE, click the LIBRARY icon on the LMS menu bar to go to the Library portal. 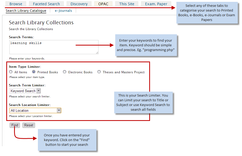 Click the “Search Library” button on the Library left side-bar. You will be taken to library catalogue page. Key in your SEARCH TERM in the search box. A search term is like ‘learning skills’, ‘smart school’, etc. Find your search term(s) in your assignment topic. It should be simple and precise. Do not type the whole search topic. You may want to limit your search by Title, or Subject if you like, by default we have configured the system to search all fields. See image below. Once you have entered you keyword, you may continue by clicking the “Search“ button. In this Example, we will be using ‘learning skills’ as the keyword and Search Term Limiter will be set as “Keyword Search”. 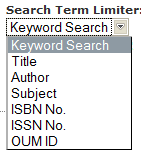 Based on your preferences, search term limiter is used to constraint the search process to either Title or Subject or Author or All Fields. If we select Title, the system will search for materials that contain your keyword in Title only.